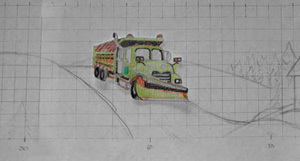 The small picture of the snowplow I drew, in the design phase, is going to be the first template. The details were added to the small truck including the lines denoting windows, side mirrors, bumpers, etc. Once the truck was rendered with the desired details, it was time for me to go measure and sketch an actual snowplow to add on the front of the truck. I was working on the Penn DOT premises so a snowplow was not difficult to locate. This is the small template for the snowplow positioned on the winter scene design rendering. This will be the key to creating the life-sized template for the snowplow. Measurements were taken of the snowplow and the angle of the blade to give me an idea of where this would fit on the front of the truck. 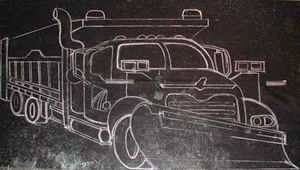 The preliminary template design was completed by adding the snow plow to the front of the truck at the desired angle. Next I added details to the template with colored pencils. This step is optional but allowed me to start considering what colors would be used during the fabrication phase. With the added color the parts of the truck could be seen more clearly and the separate shapes were better defined. At last, I was able to cut out the truck from the sheet of paper and place it on the original drawing to see how the truck felt in relation to the surrounding hill. It was a good fit and had the desired perspective, so I began the next step which would be a life-sized template. The life sized template was a massive 8'2" tall. I had to secure two separate strips of tar paper together with duct tape to get enough surface area to sketch the entire truck. The life sized template was the next step in the process. The first objective would be to find the dimensions of the template by counting the number of squares on the small template and converting each square into a square foot of area. I rolled out a couple parallel sections of tar paper, connecting the consecutive strips with duct tape. I prefer tar paper templates, over cardboard, for high detailed work because tar paper cuts easier and has cleaner edges. I still like cardboard for three dimension structure mock-ups because of its inherent rigidity. Using various reference points and places on the small template, I converted the small template onto the life sized tar paper template with the use of chalk. This was completed in a painstaking process where I would periodically bring out a ladder to stand on to view the whole developing image from above. By using the ladder I was able to double check the proportion and perspective of the template from a distance, without having to move the template from one place to another. The life sized template was completed and checked for accuracy. The template would be used to determine the size and shape of the aluminum road sign pieces for the actual fabrication phase.